Please join us on Thursday, October 18th for this unforgettable adventure and educational opportunity. Without the presence of coal (black gold) in Western Pennsylvania, Pittsburgh would never have become the Steel Capital of the world. Coal mining began in Pennsylvania in the mid-1700's, fueled by the Colonial iron industry. 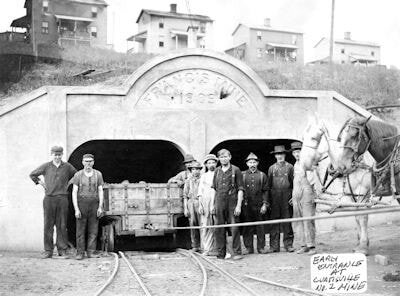 Bituminous (soft) coal was first mined in Pennsylvania about 1760 at "Coal Hill" (present-day Mount Washington), just across the Monongahela River from downtown Pittsburgh. The coal was extracted from outcrops along the hillside and transported by canoe to the nearby military garrison at Fort Pitt. By 1830, the city of Pittsburgh (dubbed the "Smoky City" for its heavy coal use), consumed more than 400 tons of bituminous coal per day. The Pittsburgh Coal Seam, especially the high-quality coal from the Connellsville District, had the best coal in the nation for making coke, the principal fuel for iron blast furnaces. The first use of coke in an iron furnace occurred in Fayette County, Pennsylvania, in 1817. During the mid-1830's the adoption of beehive coke ovens, named for their dome shape, further spurred the use of Pittsburgh-seam coal in iron furnaces. Over 10 billion tons of bituminous coal has been mined in 21 Pennsylvania counties (primarily western counties) during the past 200+ years of mining. This is approximately one-fourth of all coal ever mined in the United States. In addition to the mine and museum tour, we have arranged for two speakers from NIOSH to talk to our group about the hazards of mining, in particular the occupational lung disease known as black lung (coal workers pneumoconiosis). Dr. David Blackley is an epidemiologist with NIOSH in Morgantown, West Virginia. He holds degrees from NC State University, East Carolina University, and East Tennessee State University. David was an Epidemic Intelligence Service officer starting in 2013, and did occupational health research focused on coal miners, oil and gas workers, and commercial fishermen. He also deployed to West Africa during the Ebola epidemic. More recently he's worked to develop occupational health services for miners in Zambia, and partnered with clinics in central Appalachia to investigate the resurgence of coal workers' pneumoconiosis. Dr. Scott Laney is a research epidemiologist with the Respiratory Health Division of NIOSH. He has degrees from Emory University and the University of Pittsburgh, served as an Epidemic Intelligence Service Officer in Vermont, and joined NIOSH in 2007. His primary research focus is the epidemiology of coal workers' pneumoconiosis. His occupational health research was put on hold during 2014-2015 to respond to the West African Ebola epidemic. He is now back at NIOSH conducting research on the causes and consequences of coal mine dust lung disease. The event begins at 11:30 am, where we will gather at the mine’s picnic pavilion for a quick pizza lunch followed by the NIOSH talks and mine safety orientation. As the mine car only holds 20 people, the first group will enter the mine while the second group tours the museum. Because of these limitations we must limit signups to the first 40 people to register. The Tour-Ed Mine’s address is 748 Bull Creek Road, Tarentum, PA 15084 (less than 1 hour from downtown). Be sure to turn left on Rt. 366 after exiting Route 28 northbound (Exit 14). (Frank Pokrywka's Garmin took him right on 366 into Tarentum. (Don’t turn right). The mine entrance is only a few hundred feet off the exit to the left. You can’t miss the sign! Their phone number is 724-224-4720. Please visit their website https://tour-edmine.com/ for more information. Register online before Tuesday, October 16. ​SPACE IS LIMITED TO FIRST 40 TO SIGN UP!